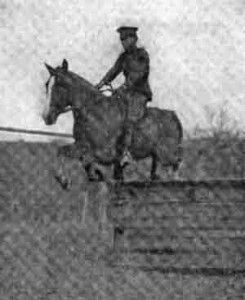 The following article titled, Equitation, is from the class of 1912 Rasp and is compiled by Captain Guy V. Henry. It’s an interesting account of the changes in thought and need that transpired over a 9 year period. After World War I the school was renamed the Cavalry School and became the finest training program of it’s kind in the world. Interesting to me are the types of horses used, the development of instructors and how candidates were chosen to attend the famed French School at Saumur. You’ll enjoy the photos that show the Saumur influence before the Italian style of jumping was added to the program. If you are an advocate for the Military Seat you’ll enjoy this article. It’s rather long but better in one reading than in two parts. Thanks for joining me on U.S. Horsemanship. May you have the best of riding this winter season. Based on the lines of a practical school of application, a minimum amount of theoretical work was required of the officers until the appearance, in 1902, of General Orders 102, War Department, which established post schools for officers, and made Fort Riley no exception to the rule. During 1902 and 1903 this order remained in effect against the recommendations of the School Board, which felt that Fort Riley should fulfill its vocation of a practical school of application for the two mounted arms. In 1902, during a conversation between General William H. Carter and Colonel C. C. C. Carr, then Commandant of the School, the question of establishing a course in equitation came up. The outcome of this conversation was, that in 1903 Captain Walter C. Short, 13th Cavalry, was sent to Fort Riley, with an idea of his services being used as an instructor in horsemanship. Captain Short remained at Fort Riley a number of months engaged in drilling recruits and later on in the establishing of the Farriers’ and Horseshoers’ School. For the school year 1903-04 the School authorities convinced the War Department that the application at Fort Riley of General Orders No. 102 was not for the best interests of the Service, and they were allowed to substitute a one-year course more suited to the needs of the School. This course was for officers with less than ten years’ service, both artillery and cavalry, and consisted of minor tactics, drill regulations, topography, hippology, theoretical horseshoeing for officers of field artillery, theoretical and practical horseshoeing for officers of cavalry, and equitation and horse-training for officers of cavalry. The bending lessons, combining the leg aids, were then taught, mounted. The horse was taught all the turnings on the forehand and haunches. The McClellan saddle, with open iron stirrups, was used, the foot being shoved clear through, so as to correct the seat and teach the rider to avoid depending on stirrup-riding, thus encouraging knee pressure. The double bridle, consisting of curb-bit and snaffle, was put on the horse, and he was taught bending lessons with the curb. Here every effort was made to put the horse’s head into a position so that the animal would be balanced for collected work. All the foregoing work of the snaffle was thoroughly taught to the horse with the double bridle, using the curb as much as possible, thus preparing him for the curb alone, as is prescribed in the military service. These exercises very soon trained the horse to guide by the neck and the pupil to handle four reins. As horse and man advanced in training, the horse was educated to extend himself in the different gaits and to do the changes of direction and lead and the turning on different legs while moving at different gaits. The oblique gallop was taught to such horses as advanced in handiness. and on the longe. Next, the horse was ridden over the jump in the chute, using the snaffle bridle. After the seat was confirmed, the double bridle was again used, and the horse was required to jump obstacles as high as his power permitted. The in-and-out was used successfully, and is a good means of confirming the seat. The English saddle was then used, the purpose being to educate the officers to ride it in case at any time they should be unable to obtain the McClellan saddle—for example, when on leave or when detailed as military attaché. 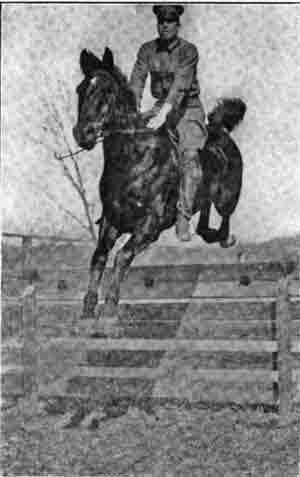 Some form of the English saddle is ridden in almost every country, and the style of riding is so different from that of riding the McClellan saddle that a man is liable to make himself ridiculous in the attempt, unless he has had experience in riding it; and it is expected, of course, that the American cavalry officer is an expert rider. Students were taught to do the same work in the English saddle as in the McClellan saddle. 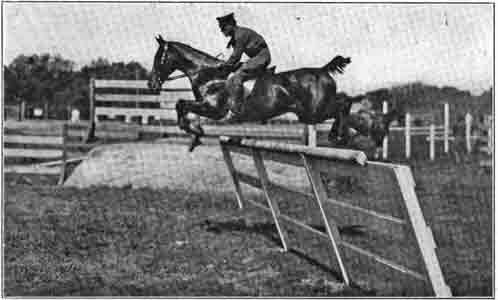 A number of horses that were fairly high-jumpers were used for high jumping; the English saddle was ridden for this, as being especially adapted for that purpose. The jumps ranged from 4 to 5 feet 8 inches in height. A difficult course was then used for gaining proficiency in handling the pistol and saber on horseback. The course contained two pistol-heads, a three-foot jump, two head-posts, and a ring. Wax-covered paper bullets and revolving targets were used. All this work was done at a brisk gallop, with strict attention to handling the horse. In looking back upon the work of this class, with its ninety hours given to horse-training and the methods used and the results obtained, they appear very crude compared with the classes of to-day. Speaking from the standpoint of equitation, it really had very little; but from the standpoint of horse-breaking, using the various devices of the West and of the professional horse-breaker in general, such as war bridles, throwing riggings, hobbled stirrups, use of the lasso, etc., the class did excellent work. There was no member of it, however, who did not learn and who was not a better horseman at the end of his course than at the beginning. The visit of that excellent horseman, Mr. Edward Anderson, had a marked effect upon all, and did much toward advancing the work in equitation and in giving improved methods by which to work. All officers who had completed this one year’s course and who left the post before the beginning of the next school year were for the first time carried in the Army Register as graduates of the School of Application for Cavalry and Field Artillery. In this connection, however, it must be remembered that only the officers of cavalry had received instruction in equitation and horsemanship. Of the nine graduates so carried, only three are from the cavalry and can be considered as forerunners of the present Mounted Service School. This year saw many improvements in the School. The course for 1903 and 1904 had been of but one year’s duration. As the normal tour of duty for troops at the School was three years, this one year’s course meant to the officers a repetition of the same thing for two more years or two years of stagnation. In order to avoid this, the School Board expanded the one year’s course into a progressive one, covering three years. This applied to equitation and horse-training as well as to the other subjects covered at the School. The students still continued to be officers of less than ten years’ service. Those who had been through the preceding year’s course became the Third Year Class (eight officers). Those who had not been through the preceding year’s course were divided into First and Second Year Classes, and for equitation purposes were combined (twenty-three officers). The officers of field artillery were now required to take the equitation course with officers of the cavalry. For the First and Second Year Classes ninety hours were allotted, beginning January 10th, with work for one and one-half hours per day. A series of recitations on the theory of bits and bitting, seats and saddles, etc., had previously been a part of the course in hippology. These recitations were transferred to the course in equitation in order that theory and practice should be under one instructor. All student-officers were required to select from their organization two horses; first, one of good conformation, showing intelligence, uninjured mouth, a minimum of weak points, preference being given to animals having had the least handling; second, a horse to be used in high jumping. In the First and Second Year Classes, starting with these comparatively” green” horses, and following the general principles of the preceding year, the student was required to properly bit, supple, and train them, carrying his work as far as the time available- would permit. While these two classes made much progress and on the whole showed great enthusiasm, the system of taking all the young officers on duty at the post commenced to show its defects. Many were not natural horsemen, either by physique or disposition, and the idea first arose of bringing specially selected officers from the various regiments to the School for instruction in equitation. This was strongly urged by the Commandant in his annual report, as well as was the building of the necessary quarters for them, the building of a riding-hall for the use of the School itself, and the building of School stables. inclusive. Instruction in the use of the cavesson and longe; bits and bitting; bending lessons; military seat; the park and jumping seat; collected gaits; school riding; correction of vices. For the Second Year Class of each arm the dates for instruction were the same, with one and one-half hours per day, and instruction in school and high-school training; high jumping. There were about twenty officers in each of these classes. Two events, however, stand out prominently and mark a great advance for this year. The first was the purchase of twenty unbroken well-bred colts and their training by the Third Year Class; the keeping of these colts together in an old abandoned stable as special horses belonging to the School, and the detailing of selected men on special duty for the care of them. The success of the class of eight young officers directly from West Point had been so marked, and the difficulties of maintaining the three-years course of instruction with the post officers had been so manifest, that this latter was done away with. The course was changed to one year for such officers as the Commandant saw fit to detail from the post and for specially selected officers sent to the School from the different cavalry and field artillery regiments. The School Board felt that by eliminating most of the theoretical subjects taught at the ordinary post schools and keeping only special subjects for this School, with the one-year course, the results obtained would be far greater than under the old three-years course, and the number of graduates would be multiplied by three. This was felt necessary, as the crying need in the Service was a system of equitation—a school of instruction, where that system could be properly exemplified and taught, and from which graduates could be distributed throughout the mounted service to become instructors of others. To carry out the above, seventeen specially selected officers from the different cavalry and field artillery regiments and twenty-one officers from the post were detailed for this year. A portion of the latter were officers completing the third-year course of the old scheme of instruction. The scheme of instruction for this class followed in general the lines laid down for the special class of West Point graduates during the preceding year. 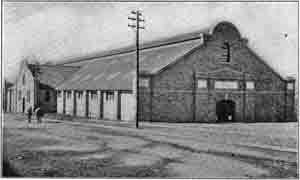 Great improvements were made in the equipment of the School: a large new stable was built; two old stables remodeled; a School riding-hall commenced; an additional number of young horses bought; the School pastures enlarged and re-built; and also the relief of the special-duty men effected by the detail of Troop M, 10th Cavalry, for the purpose of taking care of the horses of the School. All together, it was a successful year, especially from an organization standpoint and from making the equitation work a special department in the School. This year saw many changes in the organization, equipment, and methods of instruction at the School. The name was changed from the “School of Application for Cavalry and Field Artillery” to the ” Mounted Service School,” the former being abandoned as a school. This year saw also the virtual separation of the Mounted Service School from the post. All technical subjects not strictly connected with the horse, except topography, were eliminated from the course. The Department of Equitation was created as a distinct and separate department, and the number of instructors increased from one to three. It was generally reorganized and its methods of instruction changed so as to more or less closely follow those of the French Cavalry School at Saumur, France. In order that the work in this department for this and succeeding years may be well understood, I will go into it rather fully. The aim of the instruction during the entire year was to make the ideal mounted officer—i.e., the officer who under-stands and can put into practice the correct principles of equitation; who knows the strength and weakness of his horses; who is a judge of the proper type of horse; who thinks and acts quickly; and who can ride fearlessly and well at all speeds across any ordinary country. With this in view, the course was so arranged as to endeavor to give thorough instruction in the riding-hall in breaking and training, in acquiring a firm seat, and a knowledge of the aids, following this up, as the student progressed, by hard and fast gallops across country, taking such natural and artificial objects as were found in the way, and by the playing of polo. First-Year Colts.—Horses when received entered this class, and during the first year at the School were taught the use of the cavesson and longe, to carry the rider straight ahead, and to make the simple turnings. Second-Year Colts.—Colts that passed through the first year’s training entered this class to have their education as officers’ chargers completed. Jumpers.—This was a class of aged horses, recruited annually from the second-year colts, on which the student-officer was taught to jump, to ride across country, the use of the aids, and given general experience by riding many different horses. Service Mounts.—This was a class of aged horses, recruited annually from the second-year colts, and were well trained mounts, on which the student practiced the use of the aids and the various movements which he was to teach to his training-colts. One of this class of horses was assigned to each student, which he looked upon as his own and took out for a run after the hounds or a ‘cross-country ride whenever he was so disposed. Polo Ponies.—Used for instruction in this subject. In the different classes enumerated above there were 155 horses, and in addition thereto 20 horses were obtained and trained for use of the cadets of the United States Military Academy. hours per day, and, as many of them owned private mounts, the time frequently ran up to eight hours or more. In all, 892 hours were spent in the saddle under the eye of the instructors. Each student-officer completed the training of one “second-year colt” as an officer’s charger. These colts, as a rule, were horses which had been worked with by the preceding year’s class. 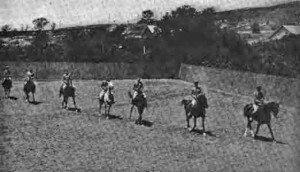 Their training comprised: training with the cavesson and longe; jumping; suppling of the horse; general use of the aids; gaiting; work on two tracks; turning on the forehand and haunches; backing; galloping right and left; counter-gallop; changing of lead at the gallop at will on a circle or on a straight line; and jumping of ordinary obstacles in the hall or on ‘cross-country work. Each officer was given one “first-year colt” to break; this included training with the cavesson and longe, saddling and bridling of the colt, teaching it to go straight to the front at the walk and trot with the rider, and making simple turnings. These colts had been bought especially for the School, the majority of them being thoroughbreds. In addition, each officer trained one cavalry horse for the use of cadets at the U. S. Military Academy; this training included all the work required of “second-year colts,” but not carried to the high degree that their training was, and in addition included the ordinary cavalry drill and the various mounted exercises as laid down in the Cavalry Drill Regulations; also a road-march of four days was taken. 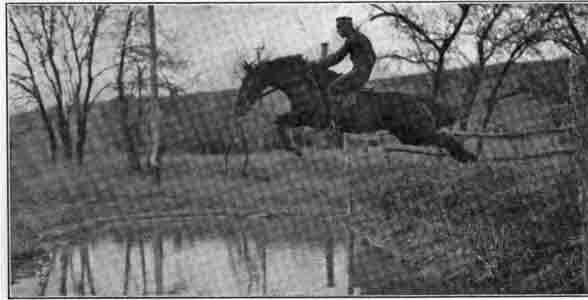 The “jumpers, service mounts, and polo ponies” were used daily by the students for the purposes indicated above under the classification of horses. With these horses the student-officers were required to change daily for the practice obtained in riding different horses and saddles. In this way the students rode between fifty and seventy-five different horses during the school year, either in the hall, at polo, or across country. The time devoted to the use of the service and English saddle was about equally divided. Most of the training-work was done with the latter, as the former was unsuited for this purpose, because of the large knots under the rider’s leg. A very large amount of the ordinary riding was done with the English saddle without stirrups, and most of the instruction in jumping was done with horses thus equipped; this in order that the rider should acquire a firm seat and the proper use of the.legs. It was found that about five months’ instruction was required to give the average student the proper relationship between the hands and legs when used as aids; also, that about 20 per cent of each class were men who would make excellent horsemen and who should be kept for a second year’s instruction for the purpose of qualifying them as instructors of officers and cadets. It was found to be absolutely impossible to properly fit an officer for such duty with only one year’s instruction, commenced with the knowledge of equitation possessed by the average American officer when he arrived at the School. Instruction in polo was carried on from April 1st until the end of the school year. In this work the officers took great interest, many of them owning then-own ponies and many of them playing during the entire year. An effort was made to develop the proper stroke and to teach all the rudiments of the game. The beginner was started in learning the stroke on a wooden horse and he advanced from there to a place in the game. Cross-country work was made a special feature; twenty-three jumps of various characters were constructed and arranged into a course on the Smoky Hill flats; fourteen others were placed in convenient positions around the garrison. The obstacles included stone walls, hedges, post-and-rail fences, double barriers, logs, ditches, “ins-and-outs,” and combinations of the foregoing. The ‘cross-country work was largely instrumental in producing the strong, close seats which were so noticeable in this year’s class. In the hall no attempt was made to teach high-school work. The light of experience showed that the young officers were unable to reach this grade with one year’s instruction. Packing was introduced into the Department of Equitation and two afternoons per week were devoted to it during April and May and one during the month of June. An effort was made to make it as thorough and practicable as possible. Instruction was given in the selection of sticks for the setting up of and fitting the aparejo, selection of cargoes, lairing, slinging, and tying the same; the packing of all classes of camp equipage; tying on a load without cincha; one man loading mule; litters for wounded; carrying bedding-rolls without saddles; arranging and packing of troop mess-boxes; relieving of bunches; the handling, care, and capabilities of the pack-train. At the end of the course the class was divided into squads of four officers, one civilian packer, five saddle animals, and eight pack-mules, and were sent on a four-days road-march. The student-officers were required to do their own packing and cooking and to care for their own animals—in short, to perform all their own work. Five of the best horsemen in the preceding year’s class were retained for a second year’s course, with the object of making them instructors in equitation. In addition to their riding-work, they were given instruction in care of horses, stabling, pastures, forage, and saddle equipment. The use of the McClellan saddle during this year was done away with. An innovation introduced during the year was the training of a sauteur—i. e., a horse that rears, kicks, or bucks upon signals, and the riding of this horse by the student-officers. The course of this’ year commenced October 1st and ended June 30th. The course this year was marked by the dropping out of all subjects which were not absolutely and distinctly connected with the horse. In addition, the courses in packing and polo were eliminated; the former, it was believed, could be taught at other posts, and the latter did not seem to give commensurate results for the time necessarily spent on the subject. It was allowed, however, to continue for such student-officers as desired play outside of their regular school-work, but was not a prescribed course for the entire class. Heretofore student-officers had been al-lowed to bring their private mounts to the School; this, for a number of reasons, had been found disadvantageous and was prohibited for the future. Troop M, 10th Cavalry, was relieved from detail with the School, and in its stead the Mounted Service School Detachment (colored), with a strength of one hundred and forty men, was organized. This detachment belongs almost entirely to the Department of Equitation and is. commanded by the senior instructor in that department. In addition to the usual supply of thoroughbreds, a number of Western horses were bought. The dropping out of packing, polo, topography, and the course of the Cooks’ and Bakers’ School allowed more hours for instruction in equitation and horse-training. “The results of the instruction were very satisfactory, and, on account of the increasing number of hours devoted to equitation, the instruction was carried further and the results obtained were correspondingly better than those of the preceding class. ” I consider that the method which has been strictly adhered to the last two years meets the needs of our Service, and should not be departed from in any particular. Many methods of training are good, but it is necessary that one should be used without variation, in order that a method will become universal throughout the Service, especially when the regiments change mounts so often. “The method used at this School is followed with the one idea of making a charger—eliminating, as far as possible, the necessity of having equestrian tact on the part of the trainer. The training stops at a reasonable point with the troop-horse and is carried further with the officer’s charger. The Second Year’s Class was continued during this year, but was not continued for the ensuing year. “The jumping was begun very low and worked up to four feet, with very satisfactory results, considering everything. 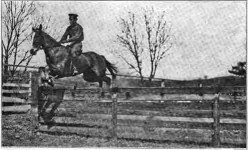 After the class began to get confidence in the horses, ‘cross-country gallops over the jumps were taken from two to three times a week, some of the officers taking the high side (four feet) of the jumps. ” 1. Development and training selected horses that should, when authorized by the War Department, enter competitions, horse shows, steeplechases, etc. Success in such events would be a credit to Army horsemanship and to the Mounted Service School; it would stimulate, throughout the Service and the whole country, greater interest in horses and horsemanship, and at the same time it would give future instructors much valuable experience. Furthermore, this work, very desirable and important in its place, would not, if conducted in this manner, be interfering in the slightest degree with the work of the regular class under instruction. 2. Assisting in the capacity of instructor; this under the direct supervision of a more experienced instructor. “After the second year, such of these officers who have been most successful or who have shown greatest promise of becoming instructors should be retained for a third year; this year they should be given greater opportunity to act as in-structors, and they should also be considered as available for competitions, etc., as in the previous year. ” Every opportunity would be afforded them to engage in polo and to make as creditable a showing in the department of horsemanship as possible. An excellent team would unquestionably be a credit to the School and encouragement to polo throughout the Service. By retaining these officers, as recommended above, polo would have a place in the School; at present such is not the case, for it should not be allowed to take the place of more serious and more important work outlined for the regular class. “It might further be remarked that to retain officers as outlined above would add zest and interest to the regular course. During each three years there would be a goal ahead for the ambitious young horseman. At the end of the second year the Commandant would be able to determine, with a great degree of certainty, whether or not an officer would make a capable and efficient instructor; if so, he should then be sent to Saumur. In case two or more officers had completed with credit the third year (or probationary year), the most suitable or most promising one should be given the Saumur detail. Having returned from Saumur with that course creditably completed, the officer could then be considered as a specialized horseman; he would then be available for detail to the Mounted Service School, or West Point, Fort Leaven-worth, or other place where the policy of the War Department provides for instructors in horsemanship. To have the Saumur candidate selected in this way should be the adopted policy of the War Department; it would then be a reward of merit and it would eliminate multifarious applications. By selecting instructors in this manner, when it became necessary to change the head of the department, an officer of many years’ experience would step into his place, and the whole machinery would move on exactly as if no change had occurred. Continuity of method would then follow as a matter of course, and uncertainty as to policy would not be experienced as it is being experienced at the present moment. ” Practically these same recommendations were renewed for the succeeding year and with every prospect of their approval. The methods of the preceding year were followed during this year’s course, with the exception of an additional amount of instruction in jumping and general outdoor and ‘cross-country work, which consequently increased the number of hours spent in the saddle. 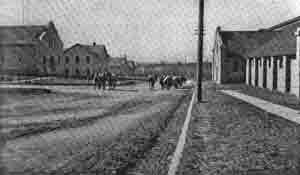 The effect of the Mounted Service School is now being felt throughout the Service; this shows itself by the fact that this year’s class upon arrival at the School, consisted of better horsemen than the preceding years’ classes contained; this resulting in a more rapid progress than that shown by any of the previous classes. One innovation was introduced—i. e., an additional training-colt was given to each student-officer to train during the year, thus making him handle three colts during his course. The first was taken up on his arrival at the School in October, the second in the middle of February, the third in the middle of April; the last, to be broken and gentled only, for the use of the succeeding year’s class. The general work of the Field Officers’ Class was similar to the preceding year, but more time was spent in riding. The course was enlarged upon, and a considerable increase made in the outdoor and ‘cross-country work. An average of three hours per day was spent in the saddle, three-quarters of an hour was used in observing the work of the regular class, and about three-quarters of an hour per day in hearing lectures and discussing various subjects connected with the horse, his care, stabling, training, etc. In addition to the regular work during the year, a team was trained to participate in the National Horse Show at New York and another to participate in the military events of the Olympic Games at Stockholm, Sweden. Each of these teams consisted of about six officers, two of whom were instructors at the School, the other four members being selected from the graduates of preceding years’ classes. In the nine years from 1903 to 1912 the Department of Equitation has changed from a makeshift affair, with borrowed horses, the using of the post riding-hall, one instructor, student-officers taken at random from a portion of the garrison, and receiving only ninety hours’ instruction to be graduated, to the excellent institution which it is to-day, with its own stables, its riding-hall, its pastures, ‘cross-country courses, detachment of grooms and caretakers, one hundred and seventy horses—far above the average of those found throughout our Service; four instructors, two of whom are graduates of foreign schools, the other two graduates of both first and second year courses of the Mounted Service School; a student class of about thirty officers, receiving about twelve hundred hours of instruction during the year, each student officer riding about seventy different horses; and a Field Officers’ Class of fourteen officers, receiving two months’ instruction. While the department has made all of these strides, it is still open for improvement and can be perfected in many ways; to do this, however, it must not only work within itself, but must have in the future, as it has had in the past, the continued support and interest of the Mounted Service. Senior Instructors.—January, 1904, to September, 1907, Captain Walter C. Short, 13th Cavalry; September, 1907, to September, 1908, Captain Guy V. Henry, 12th Cavalry; September, 1908, to October, 1910, Captain Walter C. Short, cavalry; October, 1910, to March, 1911; First Lieutenant Gordon Johnston, 7th Cavalry; March, 1911, to September, 1911, Captain Walter C. Short, Cavalry; September, 1911, to date, Captain Guy V. Henry, 13th Cavalry. Instructors.—September, 1907, to date, First Lieutenant Gordon Johnston, 7th Cavalry; September, 1907, to September, 1909, Second Lieutenant Joseph F. Taulbee, 2d Cavalry; September, 1910, to date, First Lieutenant I. S. Martin, Cavalry; September, 1910, to date, First Lieutenant John C. Montgomery, 7th Cavalry. Graduates Second Year’s Course, Class 1908.—Captain John D. Long, 12th Cavalry; First Lieutenant E. H. De Armond, 6th Field Artillery; Second Lieutenant Allen M. Pope, 2d Cavalry; Second Lieutenant I. P. Swift, 10th Cavalry; Second Lieutenant Adna R. Chaffee, Jr., 15th Cavalry. Class of 1909.—Captain Henry R. Richmond, Cavalry; First Lieutenant Eben Swift, Jr., nth Cavalry; First Lieutenant Isaac S. Martin, 14th Cavalry; Second Lieutenant John C. Montgomery, 7th Cavalry. *********************************************Received….Disposed of… Remaining in School. *******************************************Received. Disposed of. Remaining in School. GUY V. HENRY, Captain 13th Cavalry, Senior Instructor, Department of Equitation.